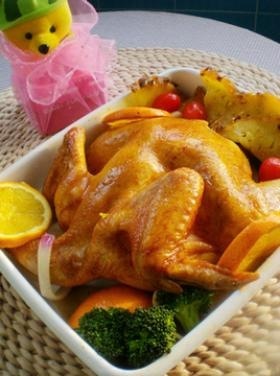 Roast chicken is very popular in many countries,especially western countries. 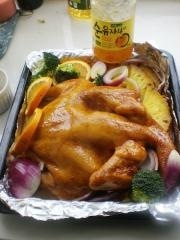 I cooked a Roast chicken with Grapefruit honey and pineapple last day to my friends. Therefore, I also share it to everybody. First of all, cut open the chicken from the stomach , washed and forked numerous holes, evenly spread on New Orleans roast chicken marinade , storage about 30 minutes. 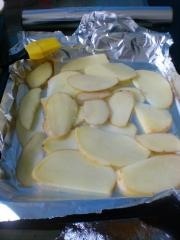 And then,lay a good foil paper on baking pan, brush a layer of oil, potato slices and two pieces of pineapple. Flat on the marinated chicken, then covered a layer of foil paper on the top. 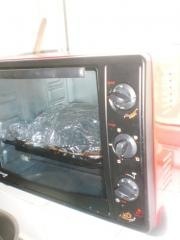 Oven preheat 190 degrees, put the chicken into the middle layer, about 1 hour. Taken out, remove the foil paper, put into above ingredients, brush a layer of the marinade juice last step.Preheated 180 degree is completed, put the chicken into the middle layer, timing 20 minutes. 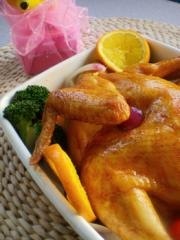 After take out and brush a layer of grapefruit honey and continue baking for 5 minutes. 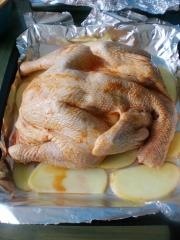 The Roast chicken is finished.